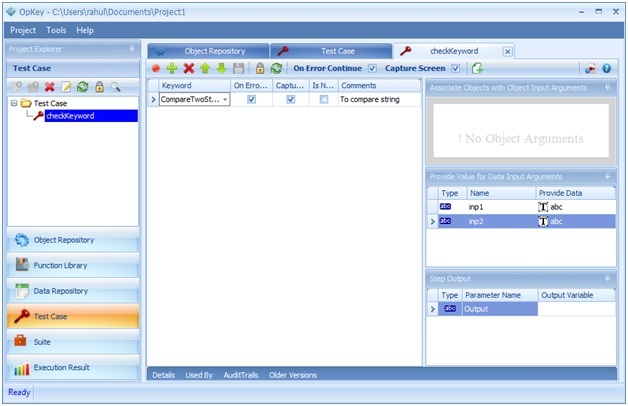 Inside Eclipse select the menu item File > New > Java Project to open the New Java Project wizard. Type "OpKeyCustomeKeywordProject" in the Project name field. Then click on Next and then Finish. Create new folder in the Package Explorer “src” folder. Type “WebdriverFiles” in Folder name. Then click on Finish button. Copy “opkey-pluginbase-x.y.jar” ,” webdriverplugin-a.b.jar” and paste these files to the created “WebdriverFiles” folder above. Explore “WebdriverFiles” and select “opkey-pluginbase-x.y.jar” ,” webdriverplugin-a.b.jar”, "selenium-p.q.r" files. 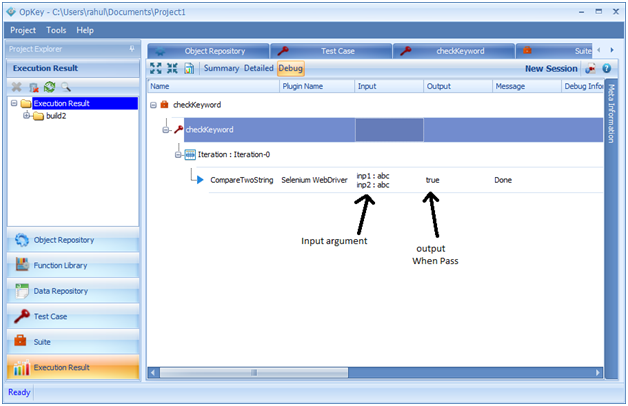 Then add these files in build Path by right click on these file and select Build Path >Add to Build Path. Select the menu item File > New > Class to open New Java Class wizard. Type class name “CustomeKeyword” in name. Click on Finish button. 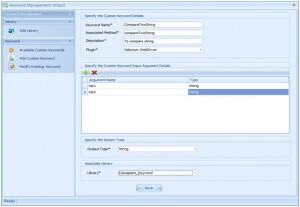 Now you are ready to create CustomeKeyword. //Fail return Result.FAIL(ResultCodes.ERROR_ARGUMENT_DATA_INVALID).setMessage("Both strings are not equal") .make();}} }str1,str2 : Input Parameter. 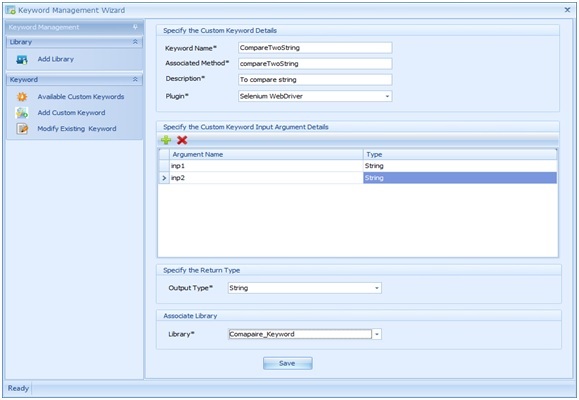 Rest all are optional in both PASS or FAIL case */ Export CustomeKeyword Class -Right click on CustomeKeyword class under Package Explorer and select the Export option to open Export wizard -Explore Java folder and select JAR file then click on Next button to open JAR Export wizard. Click on Browse button to select the export destination. Then click on Next->Next->Finish button. Now you are ready to add custom Keyword in OpKey. 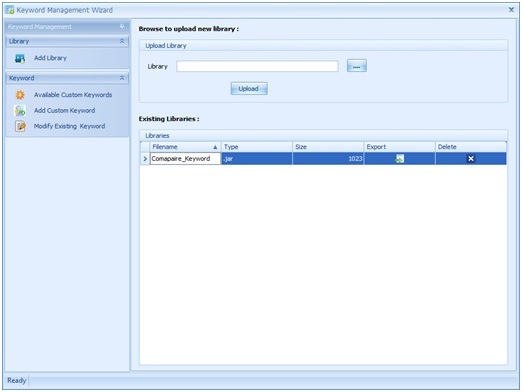 Upload the specific custom keyword jar using browse button. 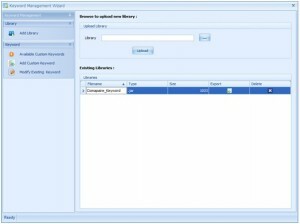 Then click on upload button to upload the file in OpKey. Click on Add Custom Keyword to create Custom keyword. Keyword name : Give the name of your keyword. Associated name : Name should be same as provided on you jar file function name. Description : Description of your keyword. Plug-in : Select the Selenium Webdriver plugin. Input argument details : Argument should be in same order as provided in function. Output type : Should be same as your function. 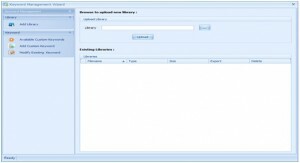 Library : Select Library (jar file) from drop down list. Then click on Save button to save the custom keyword. Custom Keyword is added in OpKey. Now we can use custom keyword. 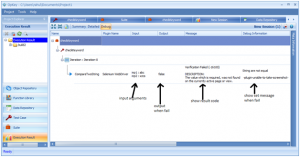 Use of custom Keyword in OpKey Navigate to Test Case module and add new test step . Click on keyword cell . On the right hand side provide the input argument value. Navigate to Suite and add Test Case. Case 1:- Both string are equal. setOutput(true) :- show on result Output column. Case 2:- When input argument strings are not equal. setOutput(false):- show on result Output column cwindow. 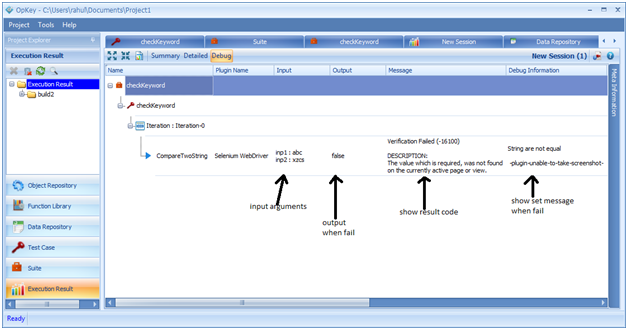 setMessage("String are not equal"):- Show on result Debug Information column.